Panini is a type of Italian sandwich, usually made with breads like ciabatta, grilled in a sandwich press and served hot. 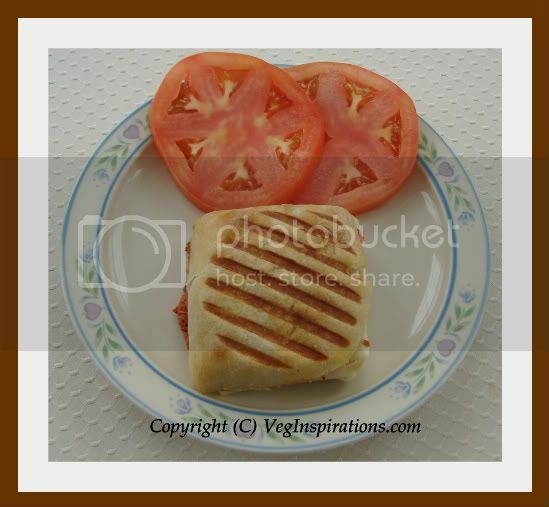 The first panini I tried was a tomato mozarella panini at Panera bread, this panini soon became a favorite and I looked forward to it, whenever I visited Panera bread. The combined flavors of sundried tomato pesto, fresh basil and mozarella in a grilled sandwich is simply delicious. Thanks to CSN stores I now get to make this and more varieties of paninis in my own home. I have done a review of the panini maker below and I have to admit I just love this gadget, it is such a fabulous addition to my kitchen. In the short time that I have had it, I have already tried so many different types of panini. 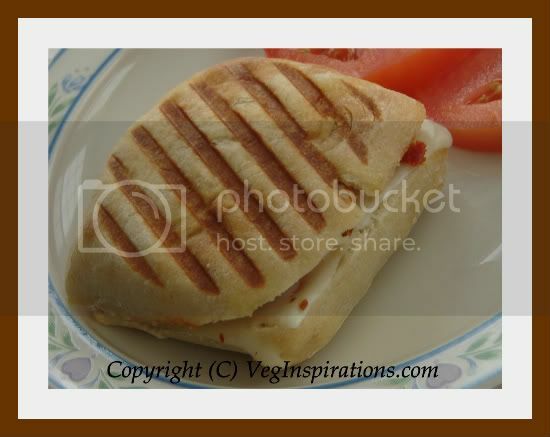 Since tomato mozarella panini is such a favorite I started with that one first. I tried it a few times with ciabatta bread, a couple of times with some other types of Italian bread. Instead of using fresh basil, which is a little difficult to find right now, I used a pinch of dried basil. The verdict.....this panini exceeded my expectations and I was so happy with it, every variation of it tasted very good. It is also great that it can be put together in a matter of minutes making it ideal for quick dinners or lunches. Switch on the panini maker to pre heat. To assemble the panini, cut a ciabatta bread horizontally. Apply sundried tomato pesto to both sides of the bread, layer one side of the bread with tomato, mozarella, sprinkle a pinch of basil and a little red pepper flakes if using. Place the other bread on top. Brush the outer sides of the bread with a little olive oil and place in the pre heated panini maker. Close and hold down gently for a few seconds. When done, remove and serve hot with soup of choice. I think this Minestrone soup, or this Minestrone with pesto would go very well with this Panini. 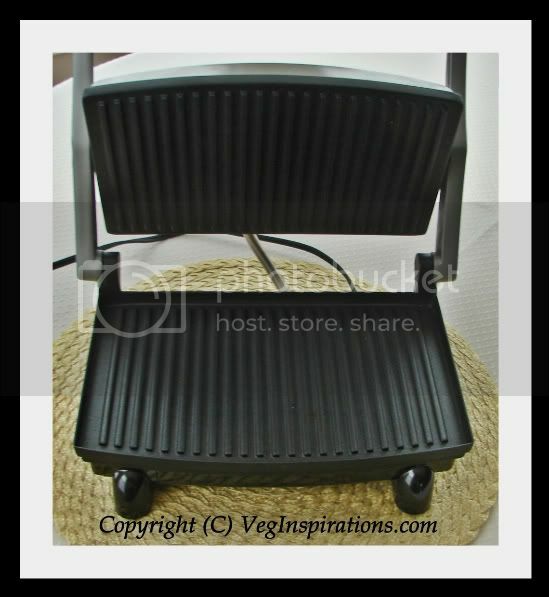 Finally here is the review of the Panini maker that I first referred to in this post. As I mentioned before, CSN stores is one of the largest growing online specialty retailer with over 200 stores offering a wide range of products. Whether you want a bathroom sink or some cookware, some lighting or home decor CSN stores seems to have it all. 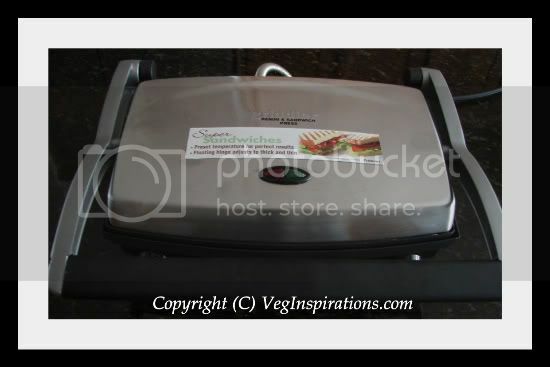 They recently approached me to do a product review from their site.They sent over this Cuisinart Panini and Sandwich press to use and then do a review. Thanks CSN for giving me this opportunity. A panini maker has long been on my list of things to buy and the idea of making different variations of paninis in my own home is very appealing. How does this panini maker work? It has a preset temperature and all you have to do is to plug it in, the red light comes on and it starts to heat to the preset temperature.This panini maker does not have an on/ off switch, so you need to plug it in to start the machine and pull out the plug to stop it. When the preset temperature is reached, the light turns green indicating the unit is ready to be used. It just takes a few minutes for the light to go from red to green. It has non stick surface and so far, since I began to use it, clean up has been a breeze. After the unit cools down, I just wipe it with a damp kitchen tissue and follow up with a dry tissue and it is clean and ready to be stored. The panini maker also comes with a scraper, but I have never needed to use it until now. The flexible floating hinge makes it easy to make paninis that are both thin or thick. Pretty large surface, can handle more than two paninis at the same time. When plugged in, the unit heats up fairly fast, it gives me just enough time to put together the panini. Usually when I am done assembling the panini, the units light turns green indicating that it is ready, I just place the panini and close the lid and in a few minutes, I have an evenly hot and golden brown panini ready to eat. Has a neat cord storage at the back that allows me to wrap the cord out of sight. One minor quibble with this unit is that it cannot be stored upright, so it occupies a little more space in my kitchen. It would have been nice if this panini maker could be stored upright. The other small quibble is that it would have been nice to have an on /off switch, other than this I have really not seen any big cons to this panini maker. This is an honest product review. My review was not influenced in any manner by CSN stores or Cuisinart. In compliance with FTC rules, I disclose that this product was provided free for the purpose of a review. This was not a paid endorsement nor have I received any compensation in any form to do this review.